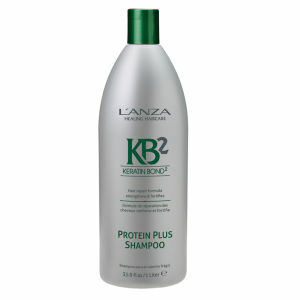 Gently remove build up residue with L’Anza KB2 Daily Clarifying Shampoo. It’s a non drying deep cleanser that gently rids your hair of dulling build up as it normalises the oil levels, returning the hair to its natural, healthy state. L’Anza’s remarkable Keratin Bond System 2, KB2, contains advanced healing ingredients to strengthen, replenish and renew each strand from root to tip. This unique healing action helps hair colour remain truer and longer. KB2 Daily Clarifying Shampoo is rich in antioxidant Vitamins A, C and E that provides daily hair nourishment for optimal health and shine. It restores moisture where it’s needed most. The shampoo is gentle enough for daily use. Apply the shampoo to your damp hair. Lanza daily clarifying shampoo plus Lanza detangler. This shampoo is golden! Thoroughly removes build up and your hair feels super clean and soft :) wouldn't change it for anything else. For many years i have enjoyed using salon shampoo's, conditioners etc and have used brands such as Redken (using up several types at the mo), Joico, Sebastian, Matrix, Paul Mitchell. This clarifying shampoo is without a doubt the nicest i have ever purchased. Sometimes when we purchase a different brand, well i don't know about you other ladies/gents, but i hope my hair will like it as it isn't that cheap for the initial purchase especially if your buying both shampoo and conditioner. If your anything like me, a bit of a hair snob hehe, i'd buy the whole range in one go if i could... anyway enough of me day dreaming, but joking aside i was soooo pleased with this product. Used it for the first time as soon as it arrived and my hair felt gorgeous and full of body. I have highlights and they looked brighter and noticeable. We all read reviews on these products and hope for they will be suitable for our hair type, i have to say i can't recommend this product enough. When i've used up my Redken shampoo's and conditioners i am going to purchase the Protein range in Lanza. Looking forward to seeing the effects on my hair. Absolutely brilliant product Lanza. Will recommending to friends and family. One very pleased customer. I have quite fine, naturally curly hair with a fairly loose curl pattern. I find product build-up on my hair a particular problem, it can leave it dull and flat, with less definition to my curls. My regular clarifying shampoo had been discontinued, so I was looking for a new one when I saw the reviews for this. It really is amazing-I could tell, even when I was washing my hair in the shower that this was something a little different and perhaps a cut above other products. My hair felt squeaky clean yet super smooth. I really was amazed at the difference a simple shampoo could make, even whilst still using my regular conditioner and styling foam. My curls were smooth, shiny, defined and bouncy. Lovely light, fresh, natural fragrance too (hate heavy, cloying scents in hair products). I've just ordered a L'Anza conditioner and will most likely order a styling product too. Think I'm a total L'Anza convert, this shampoo is a definite winner. I was on a hunt for a long time for a new clarifying shampoo. the shampoo from L'anza will remove all residue guid up and leaves your hair shiny and so much easier to handle. I love L'Anza products and they are well worth the money! L'Anza KB2 Daily Clarifying Shampoo is good and really leaves your hair healthy. It's great for fine hair as it leaves no weight and gives bleached hair a shine! I shampoo my hair daily and this is one of my main favourite products. It leaves my long blonde hair shiny and in good condition. Good product, but if your hair is coloured this will take out the colour as well, but other than that its quite good.